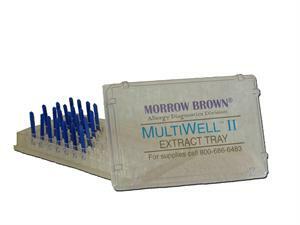 Testing efficiency can be increased by using the MultiWell™ Extract Tray dip test system in conjunction with Morrow Brown® disposable test needles. To use MultiWell™ strips, place into the base tray, use as many wells as needed to correspond to your test sheet. Each tray holds up to 96 wells of extract. For easier handling, customize the tray by aligning the wells on the initial set-up to match the antigen tests printed on your laboratory test sheet. Leave an empty row between extract rows for easier handling. Label each row accordingly. Add 1:10 or 1:20 w/v glycerinated extract to each well. Seven drops per well can be used which will yield 25 test. (Note: if using histamine and saline controls, make sure they are glycerinated). For storage, cover the tray with lid seal in a plastic bag and store in a refrigerator. Trays may be stacked on top of each other. After removing needles from package check the points of the needles for possible abrasion . Remove MultiWell™ tray from refrigerator and place Morrow Brown® disposable needles, point down, into each MultiWell™ used. Mark test sites on patients arm or back. Remove each needle individually, and press firmly into the corresponding test site. Each needle delivers a consistent amount of extract (surface tension of the glycerinated extract allows extract to adhere to the needle without dripping). Dispose of needle after each use. Add new needles to wells for use as needed. Read test site 15-20 minutes after application. Each well yields up to 25 tests. When testing has been completed, replace lid, insert in storage bag provided and refrigerate. Mark testing sites and place a small drop of glycerinated extract beside each ink dot. Holding the Morrow Brown® needle perpendicular to the test site, punch firmly through testing extract and into epidermis. Direct comparison of wheal diameters between different patients cannot be made because of differences in skin reactivity. A whealing reaction to a skin test must be compared to a Positive Standard using glycerinated histamine and a Negative Standard (diluent) in each patient. The grading system recommended by Morrow Brown® is one originally developed by The Standardization Committee of the Northern Society of Allergy (Scandinavia). This system is precise enough for both clinical and most research purposes. A wheal reaction the same size as the prick histamine control is graded +++ (3 plus) and a reaction the same size as the negative control is indicated by - or 0.